>Honestly, I have received enough brickbats for not being in touch with some of my close friends, not responding to e-mails, not commenting on blogs etc. etc. But if all this has to happen when you have spent two unbelievable months, then it’s worth it. With virtually no work to do by the mid of February, boredom was plauging me like anything. Just needed something which could make life more interesting for me. Somebody posted on our company intranet about an inter-company cricket tournament being planned between 4 companies (Veco, Technip, Tebodin and Worley Parsons – all engineering consultancies) to be played at the Sheikh Zayed Cricket Stadium in Abu Dhabi. This was really a mouth-watering prospect for me. In all my life, I never got an opportunity to play top-flight leather ball cricket and now one stood at my door-step. I really put myself in top gear running hard everyday after office hours, pushed myself hard to exercise and sweated it out in the completely dry but relatively cold climes of Abu Dhabi. I used to run on the hard ground outside a shopping centre and it used to pain a lot in my calf muscles. But it also made them rock-solid. We started off with a practice match against Tebodin in the last week of February before the tournament started (which was to be played on every Saturday in March). We won the match chasing down a target of 140 runs in 20 overs with myself making a handy contribution of 29 runs. After a rigorous selection process which saw the squad being pruned from an initial number of around 30 players to a final 15 for the tournament, the team was getting ready for the first match of the tournament between Technip and Veco on 3rd March. I wasn’t picked in the final eleven for the first match but was not too disappointed about not making it. 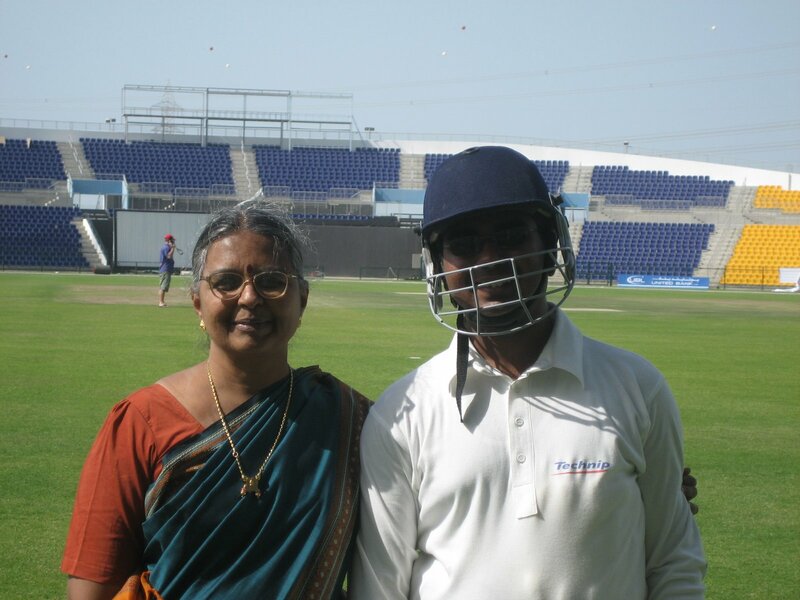 I had determined myself to practise harder and push my claim for selection in the next match. Technip lost the match quite badly and with two more league matches to go, it was going to be do-or-die for us. By now, I was showing considerable improvement in my batting which is what I had to be picked for. After the final practice session couple of days before the 2nd match, the captain indicated to me that he wanted me to play this one. 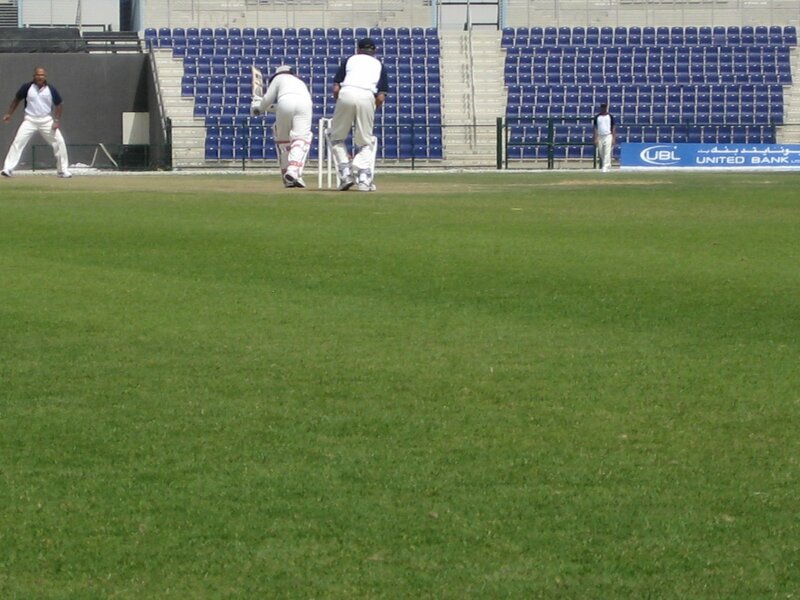 I was thrilled at the opportunity of being able to play at the Abu Dhabi Cricket Stadium in a proper leather-ball limited overs cricket match. I called up home to give the good news and went back home to get some good sleep after a tiring day at office followed by a cricket practice session unaware of what was to come. The next morning (Thursday, March 8th), just before I went to have my bath, the flat-owner came and told me he was going to India for a week. I went in, had my bath and sat down in my room to have my breakfast. The thought just passed my mind of calling my parents to Abu Dhabi to watch me play at the stadium. Though I had requested the owner previously as well, he had declined to allow my parents to stay in his flat. Besides, hotel accommodation is extremely expensive in Abu Dhabi. Still, with my fingers crossed, I went ahead and requested my owner if he would allow my parents to stay with me atleast till he came back. To my good fortune (and by god’s grace), he said yes and thus began what was to be probably the longest day of my life!!! I reached office at 8:15 am with half my mind thinking about how to get all the formalities (getting the visa, getting the ticket for the flight on Friday) done within one day!!! I tried calling a contact in my office who handles visas but he too said that it’s only possible to get the visa in 2-3 days. I wasn’t convinced. I went up to our administration department and asked them if it was possible to get visit visa for my parents in one day!!! The lady initially scoffed at me but still pulled out my salary certificate (which was completely in Arabic) and gave it to me. Then she directed me to go to one of those legal translation shops down below and get the visa application form typed by them. The form along with my salary certificate then would have to be deposited at the immigration office and perhaps there was some provision to get the visit visa (which has a validity of two months) within a day provided we make some extra payment. Sometimes, you really don’t know if what you think or plan would actually happen but really nothing should deter you from making the effort if that thing is really close to your heart. Taking a break from my office hours (which had to be compensated later), I got the form typed in an hour’s time and then took a taxi straight to the immigration office. I reached there in about half an hour’s time and no sooner I found myself running around to get to the right counter. I made all the payments and had to wait for another agonizing hour before I could deposit the form at the counter. They asked me to come back and collect the visa after one hour. I caught another taxi and headed straight to office. Work clearly was the last thing on my mind and somehow I managed to plough my mind till it was lunch time. In the meanwhile, I had asked my brother to book the ticket and keep it ready but the agent had said that he needed the visa by 5 pm (India time). I was fighting against time and completed another trip to the immigration office by 2:30 pm local time (Abu Dhabi is behind India by 1 hour and 30 min) to collect the visa after a frustrating wait for the taxi in mid-day sun. By 3 pm, I got the visa copies scanned and sent by mail. In another half an hour, I had them faxed as well to the travel agent in India. Returning back to work, I pushed myself hard to concentrate on the work but clearly I was waiting to hear from my parents if they had received the tickets. By evening time, mom called up to say that I had delayed in sending the visa and that actually the visa was to be received by the agent by 4 pm India time and not 5 pm. As a result, he had cancelled the booking and now only a fresh booking on March 10th (the day of the match) could be made. I was distraught, angry that so much effort still did not yield the desired result. Consoling myself, I asked them to get the tickets for Saturday if it was not possible to make it on Friday. I went back to my desk, almost feeling defeated. I had to put in extra hours that day as I had to make up for the office hours lost. Late in the evening, after almost everyone had left office for the weekend here, my brother calls up to tell me that they had managed to get the tickets for the next day (Friday, March 9th). A sense of relief spread through me as I just relaxed myself and shut down my PC for the day. I left my office only to realize that I had forgotten the original visas in my office drawer. I ran back to get it, got down again, went to recharge my cell and went back home looking at the sky, smiling and thinking,” Impossible surely is nothing”. One of my long-cherished dreams to bring my parents to a foreign land was standing to be fulfilled. Next day, early morning, I headed for the airport at 9 in the morning and deposited the visa. The flight was on time and soon I was standing there smiling as my parents came out. My parents accompanied me to watch the match. We won chasing 165 runs in 25 overs in a thrilling last over finish. I scored only 9 runs but managed to put up a good stand of 50 runs. Initially, I had thought of being able to accommodate my parents only for a couple of weeks but soon I was able to secure a reasonably less expensive family accommodation for them for two months. 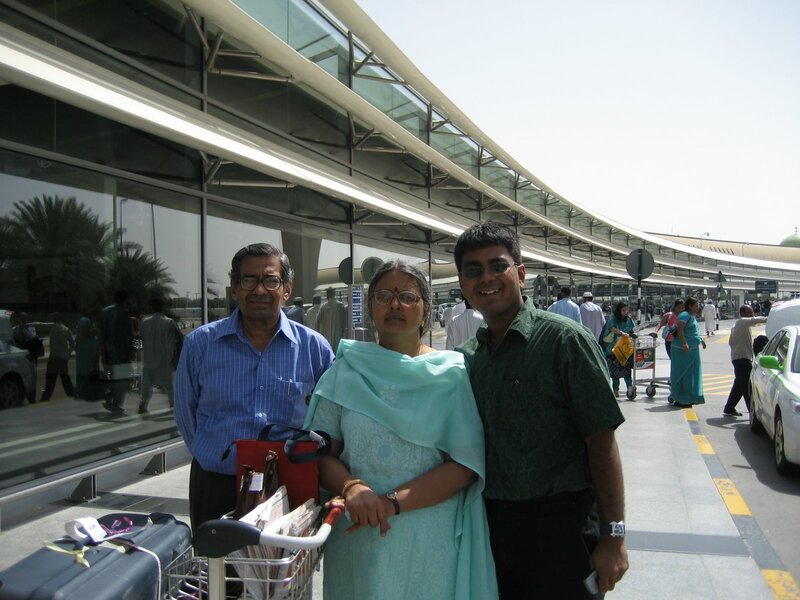 Next week, my parents went off to Dubai and Sharjah where they stayed at my mom’s friend Anna’s place and my friend Chetan’s place. In the meanwhile, unfortunately, I was down with viral fever and had to take leave from office for two days. The do-or-die clash with Tebodin was coming up on Saturday in which the winner would be through to the final. I was fighting my illness and only by Thursday had I somewhat recovered when my parents came back from their short trip. I was picked for the virtual semi-final, this time as an opening batsman. Still feeling weak and not exactly in full fitness, I crossed the ropes and marched into the ground with my opening partner after our skipper won the toss and elected to bat. This really had to be my test of character. I faced the first ball and just flicked it to the leg. My partner called, I just lifted my hand to say no but he was half-way through the pitch. My heart skipped a beat as I realized I was sure to be run out first ball of the innings and had I not run, people would have blamed me for being selfish. I just pushed the yards, half-falling, half-running. A bad throw and a miss and I managed to complete the single. A loud cheer went through the stadium from the lot of our company supporters who had come to watch the match. I hit one sizzling straight drive for four, a shot which I still feel proud of and in no time, myself and my partner each scored 21 runs and put together a partnership of 59 runs. Our captain came out and scored a brilliant fifty and we put up a massive total of 204 runs in 25 overs, which was just too much on that day for Tebodin to chase. One more week went past swiftly and soon, the day arrived – March the 31st. It was the grand final between Technip and Veco. We had lost to Veco in our league match and were definitely hoping for a reverse. Veco won the toss and batted their way to 213 runs in a 30 over per innings match. The onus was again on myself and my partner to put up a good opening stand. This time, I went on the defensive just taking the singles and giving strike to my aggressive partner who was going hammer and tongs against the bowling. In no time, 50 runs were on board when my partner retired hurt. Soon after, I threw away my wicket in a very soft manner – a shot which I regret till now. Thankfully, my captain in the company of other batsmen played stunningly to ensure that the inter-consultancy cricket cup was ours. The ground was invaded by the sizeable crowd which had come for the final and the exciting moments simply went on and on and on…A few of them said that my parents brought our team a lot of luck as we won every match after they arrived and witnessed. The month of April was very hectic – lot of work had piled up and the deadlines were closing in. I was put with long hours of work at office and used to come home tired. Ofcourse, my parents were always there which gave me a sense of relief. Still, almost every weekend, we managed to make atleast one trip – a desert safari, a trip to Al-Ain and a trip to Kurfakan/Fujairah. The desert safari was especially enthralling with all dune-bashing, sand skiing and traditional Arabic food. Al-Ain is really special for me as it is such a peaceful place with all its greenery and lack of commotion. More importantly, it was made all the more wonderful by Kartik’s parents at whose place we were put up for the night (Kartik is my batchmate from IIT Bombay). They enthusiastically took us to the Al-Ain zoo and the absolutely fabulous Jebel Hafeet mountains. If Al-Ain was fantastic, then a ride to Kurfakan was absolutely outstanding. We went with another family in a van past the Hajjar mountains and drove to the beach which was simply marvelous. I enjoyed a little swim and a short boat ride at the beach. All-in-all I thoroughly enjoyed taking my parents around UAE as much as I could. Returning back, we were all happy with fond memories to cherish. I can never forget the last two months which were simply fascinating in every sense, almost unbelievable for me. I thank God and all my close friends with whom I can now share this amazing time in my life.